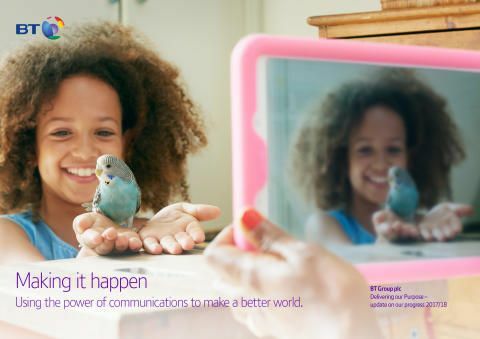 BT’s annual Delivering our Purpose report, says its products helped customers cut their carbon emissions by 11.3 million tonnes. Revenue from these products totalled £5.3bn, representing 22 per cent of its total revenue last year. This figure, up from 10 million last year, highlights how BT is using and developing communications technology to help its customers cut carbon emissions. The amount of carbon saved equates to the emissions of nearly 3 million households. By 2020, BT also wants to help its customers cut their carbon by three times their own end-to-end emissions. Currently, BT has achieved a ratio of 2.2:1, up from 1.8:1 last year. After achieving its own carbon emissions target four years early, BT set a new target to reduce carbon emissions intensity by 87% by 2030. The Delivering Our Purpose report details the company’s progress and yearly performance against all of its 2020 ambitions across a number of local and global challenges, including climate change and social disadvantage. BT’s commitment to creating a culture of tech literacy has led the company to reach more than 57,000 teachers and, through them, 1.6 million primary school children since 2014/15. The company has done this through the Barefoot Computing project, which brings computer science alive across the curriculum. This year saw BT’s fibre broadband coverage reach 27.5 million UK premises. BT also helped more people get online through our community fibre partnerships scheme, which helps bring fibre to some of the hardest to reach communities. This included BT working together with Wales and West Housing, Harrow Council, Thanet Council and Look Ahead (a charitable housing association), to, give 130,000 tenants access to free Wi-Fi since 2014. The work comes as BT helps the Government to achieve its target of supplying superfast broadband to 95% of UK premises. BT and its employees helped to raise £109m, up from £92m last year, for good causes taking the company’s total to £531m since 2012/13. £62m of this year’s sum came through BT’s MyDonate platform which provides a fundraising solution for 13,700 charities. BT has also provided free wi-fi hotspots, IT equipment and training across the globe, including healthcare centres in Ghana, helping 4.6 million socially disadvantaged people since 2014/15.